SONOFORCE is the name of Kockum Sonics group of Audible Sonic Horns used for Sonic Cleaning. 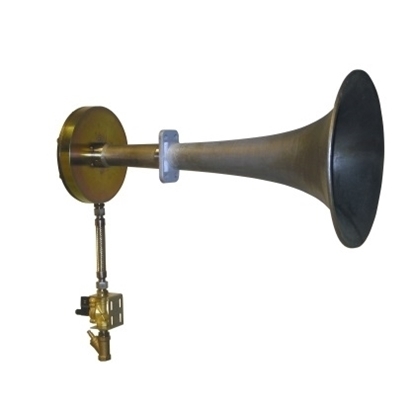 The sound is created by means of compressed air that is passing through a self-resonating diaphragm and a sonic horn. Kockum Sonics SONOFORCE Sonic Horns has been used in many different applications all the way back from the start of the cleaning by sound technology. Our standard range of these sonic horns has been successfully installed in applications having a gas temperature of up to 1000 degree Celsius (1830 degree F). Our SONOFORCE sonic horns have replaced steam soot blowers totally. Compared with steam soot blowers, our SONOFORCE System is cheaper to purchase, operate, install and do maintenance on. The other great advantages compared with steam soot blowers are that our SONOFORCE System will not cause any additional wear of the boiler tubes. This means that the lifetime of the boiler tube packages will become longer. The most resent development has been made in close co-operation together with several Catalyst cell manufacturers. This has resulted in our latest SONOFORCE sonic horn, the IKT 230/170, that is the best choice to keep clean any catalyst cells. This solution has been widely accepted in the market as the best alternative to keep catalyst cells clean.